April 24, 2010. Eucharistic Celebration for the Golden Jubilee of Sr. M. Zita Alcazar CGS, (Batangas) Sr. M. Stephen Betia (Negros), Sr. M. Vincent Borromeo (Cebu), Sr. M. Carmela Cruz (Malabon), Sr. M. Socorro Galvez CGS (Batangas), Sr. Mary Assumpta Lim (Cagayan de Oro), Sr. M. Fe Mendoza (Cebu) , Sr. M, Soledad Perpinan (Manila), Sr. M. Frances Therese Sunga (Pampanga) and Sr. M. Aida Violago (Nueva Ecija). 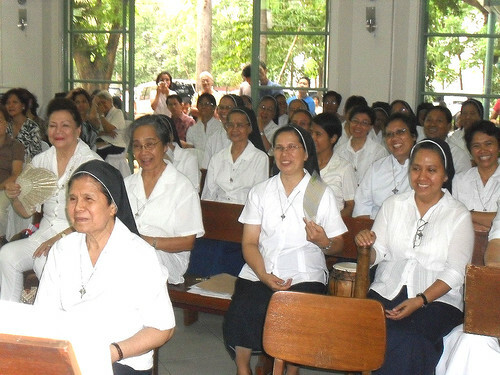 Good Shepherd Sisters, during the Mass.